You're not supposed to use a home pressure cooker as a pressure fryer. You're just NOT. So if you try this recipe and something goes horribly wrong, don't come back here and blame me. And if you do decide to try pressure frying, be very, very careful. 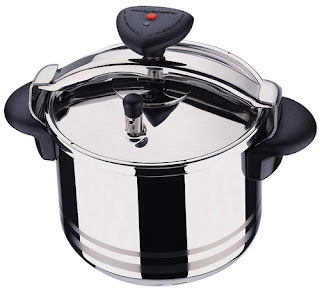 The pressure cooker I used was a Magefesa Star 10-quart pressure cooker with three different safety features, including a big metal bar clamp across the lid. I have to admit that I was a little skittish trying this for the first time. But then I realized that as long as the pressure was venting at a reasonable pace, I was fairly safe. I was ready to turn the stove off if things went wrong. I was ready to run away if it looked scary. But it all went pretty well. This is more method than recipe. You can add as much spice or as little as you like. Use your own preferred ingredients. Double-dip, or single dip. Use any recipe you like, it shouldn't affect the pressure cooking method. It took me two tries to get this right. The first time, I didn't have the heat high enough and by the time pressure was attained, the chicken had been cooking in the oil for quite a while. I have to say that even though the chicken skin was too brown, it was still good. Crisp. And the chicken was juicy. I used chicken thighs, because they're my favorite. Use whatever you like. Put the chicken thighs in a plastic zip-top bag and add the buttermilk, salt, paprika, and cayenne. Massage the chicken around so that it's coated with the buttermilk. Set aside for at least 30 minutes or refrigerate for up to 4 hours. Put the flour, cornstarch and seasonings into a flat bowl or a rimmed dish. Add seasonings of your choice. Paprika, garlic powder, onion powder, cayenne or other peppers, or a seasoning blend would be fine. I kept it simple with just paprika, a pinch of cayenne, and a hint of sage. Add the salt, if you're using it. You can also season more aggressively and use more that a teaspoon. It's really up to you. Whisk to combine. Put the eggs in another flat bowl. Put the flour and seasonings in a third bowl. You can use the same seasoning mix as the first flour mixture, or choose another - as long as the flavors go together. I used a bit of paprika. Add the salt, if you're using it. Whisk to combine. When you're ready to cook, heat the oil in the pressure cooker to 350-375 degrees on high heat. While the oil is heating, prepare the chicken. Remove it from the bag, and pat the pieces dry. Dredge in the first flour mixture (with the cornstarch) then dip it into the egg, then dredge it in the third flour mixture. When the oil is hot, add the chicken pieces in one layer. I cooked 4 pieces at a time. I might have been able to fit 5 or possibly 6, but since there were 8 pieces, I was going to have to do two batches, anyway. The oil will begin to boil as you add the chicken. Use tongs. Long tongs. Don't drop the chicken from a distance, place it gently in the oil. Put the lid on the cooker and make sure it's even and seated well - and before you put it on, make sure the gasket is dry and clean, and the rim of the pot is clean as well. If you don't get a good seal, you'll never get pressure. Clamp the lid on, according to the manufacturer's directions. Make sure the weight is on the vent. Make sure the heat is on high. You want this to reach pressure quickly. It shouldn't take long at all. Less than a minute. When steam comes from the vent and the weight starts spinning*, set a timer for 10 minutes. If the weight starts spinning fast, turn down the heat. It should keep spinning at a reasonable rate. Not so slow that it stops, but not madly spinning. Stay nearby. That vent should keep spewing steam as long as the heat is on. If that stops and the other vent pops, turn the heat off. No need to tempt fate. When the 10 minutes are up, turn off the heat. Release the pressure according to the manufacturer's instructions. When pressure is released, unclamp the lid and remove it. The oil will still be boiling, so be careful. Move the chicken to a rack or paper-towel-lined plate to drain any excess oil. Repeat with the next batch of chicken. This chicken is roaring hot inside when it comes from the pressure cooker. Just to let you know. *If you're using a different pressure cooker, follow the manufacturer's directions for checking and regulating the pressure. And make sure you follow the manufacturer's directions for releasing pressure. You want to use the "natural" method for releasing pressure - don't be tempted to cool things down faster by running water over the lid. PLEASE NOTE: Not all pressure cookers are rated for use with oil. CHECK WITH THE PRESSURE COOKER MANUFACTURER TO MAKE SURE YOURS IS SAFE. If the instructions do not mention oil-frying, it probably means they don't want you to do it! As far as I know, there are NO ELECTRIC PRESSURE COOKERS FOR HOME USE that can handle oil-frying.